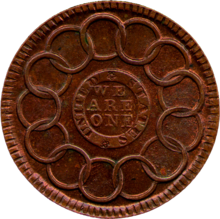 The reverse side of both the 1776 coins and paper notes, and the 1787 coins, bore the third motto "We Are One" (in English) surrounded by thirteen chain links, representing the original thirteen colonial states. Following the reform of the central government with the 1789 ratification of the 1787 Constitution, gold and silver coins transitioned to the motto "E pluribus unum" from the Great Seal of the United States. ^ Norton, Frank Henry; et al. (1875). "Notes and Queries". American Journal of Numismatics. 10 (1): 21. Retrieved 25 April 2016. ^ "The Story of Money: 11--Coin Design Inspired Fugio Cent". Federal Reserve Bank of Atlanta. Retrieved 28 August 2016. ^ "300th Birthday Retrospective: The Coinage of Ben Franklin". scvhistory.com. Retrieved 2019-03-21. The Fugio Cent of 1787: Introduction, The Coins of Colonial and Earlier America. 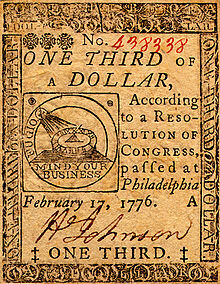 U.S. Mint: 1776 Continental "Dollar"